The values of Community Powered Change were established by community members, organizational partners, and the local health department. The image here reflects broad values of inclusion and empowerment; community leadership and participation; community-oriented approach to strategies; understanding the current and historical context of health disparities; and prioritizing health-related determinants. Three main principles support Community Powered Change. 1. We are community-led and transparent. Our work centers community knowledge and experience. Everything that has been developed is a result of partnerships between community members, organizations representing communities of color, and the county health department. 2. We use the most current evidence or best practices and strategies to address health equity. As much as possible, we pull from information that describes community level conditions. 3. We use feasible recommendations and strategies. These strategies involve and build on the existing, hard work of key stakeholders who have the ability to influence effective implementation of strategies recommended by community members. Wherever possible, Community Powered Change focuses on social, environmental, and economic determinants of health. This aligns with an upstream approach to addressing health. The concept of moving upstream is a public health analogy shared by social epidemiologist John McKinlay in an address to the American Heart Association in 1974. Imagine a rapidly flowing river where people continuously fall in. Members of this community work so much to rescue those who have fallen in, they become exhausted and are also drowning. They are not able to learn the reason why people continue to end up in the river in the first place. When community members are finally able to walk upstream to identify the reasons people are falling in the river, they see an opportunity for systemic change to improve health. 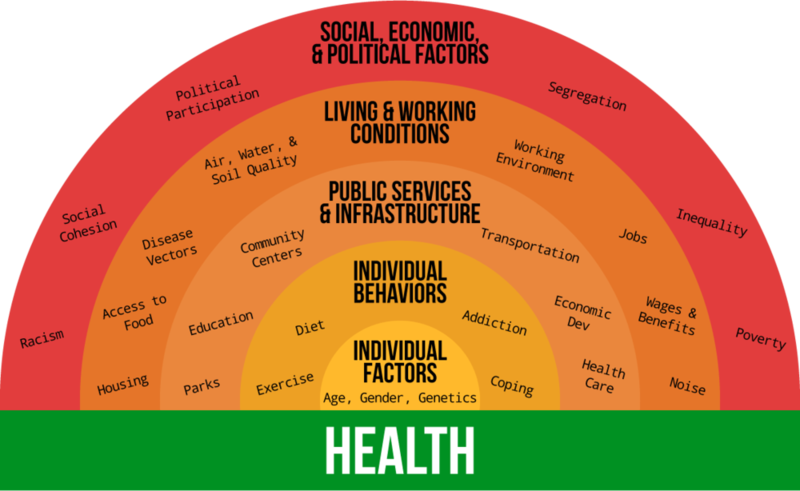 (Click to enlarge) Image description: Five concentric semi-circles show social determinants of health. The outermost semi-circle lists social, economic, & political factors: racism; social cohesion; political participation; segregation; inequality; and poverty. Moving inwards, the second semi-circle lists living & working conditions: housing; access to food; disease vectors; air, water,& soil quality; working environment; jobs; wages & benefits; and noise. The third semi-circle lists public services & infrastructure: parks; education; community centers; transportation; economic dev; and health care. The fourth semi-circle lists individual behaviors: exercise; diet; addiction; and coping. The fifth and innermost semi-circle lists individual factors: age; gender; and genetics. Health equity means everyone has what they need in order to be healthy and thrive. Achieving health equity requires valuing everyone equally so that we consider ways to prevent inequalities, address injustice, and eliminate healthcare disparities. Community Powered Change applies a health equity perspective when considering health determinants — the circumstances and conditions affecting people’s health behaviors and health outcomes — as a means to end the systematic creation of health inequities. Health equity connects the equitable distribution of power and resources, empowered people, healthy community conditions, and quality healthcare as structural drivers that lead to healthy environments and behaviors that decrease illness and gain health equity for all. Racial justice is about ensuring people of all races are treated fairly within our systems and institutions and have the same opportunities to thrive and be well. The racial justice work of Community Powered Change begins by centering communities of color, their knowledge, and experience and moves across access to different systems and institutions and the policies affecting our daily lives.